Soccer managers tend to be men with limited risk-taking capacities. But when you find one with the nerve to sneak in a surprise at a decisive moment, you know he's something special. Boca Juniors boss Alfio Basile has this rare characteristic, and he proved it once again Sunday night when he reshuffled his side's penalty shootout order so that his goalkeeper would decide the team's fate. It was well worth the risk. Roberto Abbondanzieri fired his spot kick home and Boca landed its second consecutive Copa Sudamericana title in sensational fashion after 180 minutes of deadlocked soccer with Pumas. It capped off a remarkable year for the Argentines, and perhaps more important, a sensational year for the Confederación Sudamericana de Fútbol (CONMEBOL), which couldn't have planned a more memorable tournament. For once, it seems as if the federation got it right, as the 2005 Copa Sudamericana surpassed expectations and was a huge success. For many, it is now considered the equal of, or even greater than, the Copa Libertadores, which has traditionally been South America's ultimate club competition. For fans of South American soccer, following these tournaments was nothing less than punishment, from late kickoffs to extremely low-quality soccer. As most clubs preferred to concentrate on their domestic leagues, managers fielded teams made up of reserves and youth players. Not surprisingly, this wasn't received well by the massive soccer following around the continent, and the federation paid the price. The fans turned their backs on the tournaments, with most matches played in empty stadiums and television ratings hitting rock bottom. CONMEBOL knew it had to do something to rectify the problem, and came up with several ideas knowing that one simply had to work. 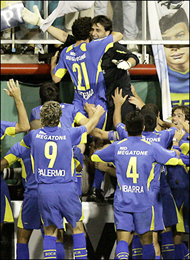 In 2002, the Copa Sudamericana emerged. This new tournament would include all the top clubs of South America, but stretched further to include teams that finished in the top eight of the standings from the strongest leagues -- Argentina and Brazil. Only a minority of fans would have guessed that this tournament would still be in existence three years later. The weary South American press originally thought it was just another excuse to pump money into CONMEBOL, but it's clear that this tournament is one of the best in the world. Part of the reason for its success is that, for once, the federation created a tournament that can be appreciated by the fans rather than by the greedy men behind the cable networks. Unlike previous attempts, the Sudamericana spares fans months of drawn-out group-stage play and treats them to pulsating two-legged knockout clashes from the beginning of the tournament to the end. While it seems unlikely, it will be interesting to see if the Copa Libertadores, European Champions League or even the World Cup will consider this exciting new format in the future. The Copa Sudamericana's new love for sweltering matchups means that clubs must face off against a team from its own country in the early rounds, often setting up immediate clashes between traditional rivals. This year, some of the preliminary-round contests included Newell's Old Boys-Rosario Central, Fluminense-Santos, Internacional-São Paulo, Goias-Corinthians, Danubio-Defensor Sporting and Universidad Católica-Universidad de Chile. These classics created wide interest throughout the continent. What also worked in favor of the Sudamericana this year was that CONMEBOL finally incorporated the away-goal rule. In past editions of the Libertadores and Sudamericana, knockout rounds were often decided by penalty shootouts, as was the case in four of the past six Libertadores finals (in 2000, '01, '02 and '04). And although Sunday night's thriller also ended with soccer's version of Russian roulette, such finishes have been limited throughout the tournament. While the Copa Sudamericana seems to be gaining recognition, the Copa Libertadores may be on the downslide. Since its expansion to 38 teams, several second-rate sides have participated, including a couple of Brazilian second-division clubs in the past two years, Paysandu and Santo Andre (winner of the Copa Do Brasil). Next year's Libertadores will include small-time São Paulo club Paulista, which finished in 15th place this past season in Brazilian Serie B. It's obvious that the Libertadores is in need of drastic changes, especially when its unique selection process means there is no room for the most successful South American club in recent years: Argentine and Copa Sudamericana champion Boca Juniors. It's unimaginable to see a Copa without the Argentines. It's comparable to seeing Real Madrid miss out on Champions League or Brazil being shut out of the World Cup. This has played a big part in bringing down the quality of a celebrated tournament that once saw the inclusion of only South America's best. For the sake of the tournament, it might be a good idea to bend the rules so that Boca can take part -- after all, defending European champion Liverpool harassed UEFA for its spot in this year's Champions League. But will the now-fashionable Copa Sudamericana be giving out any new invitations? This year's edition saw the inclusion of two Mexican clubs, Club América and Pumas, as well as D.C. United from MLS. In fact, it was the first time a club from the U.S. participated in a South American club competition since the Copa Merconorte of '01, which included both the MetroStars and the Kansas City Wizards. D.C. United jumped at the opportunity to participate in this year's Sudamericana and proved a worthy contender, narrowly missing out on a spot in the quarterfinals after a thrilling 4-3 aggregate loss against Chilean powerhouse Universidad Católica. D.C.'s good showing could mean that the federation will invite more North American clubs in the future, a risk that should definitely be taken. The success of the Sudamericana proves that things are looking bright, not only for South American soccer, but also for our ever-improving Northern neighbors, who have the potential to add an extra spark to a confederation that oozes personality. As Boca's Basile showed, it's the risk-taking that makes tournaments special.